A first appearance for Chinese Taipei’s Chen Szu-Yu, the very same for Chile’s Paulina Vega; in Markham at the Uncle Pop 2017 ITTF Women’s World Cup presented by Polar Naturals, they are the only two players on debut in the prestigious annual tournament. On the morning of Friday 27th October, in their opening encounters in the group stage of proceedings, they faced each other. The verdict went in favour of current status. Chen Szu-Yu, the no.11 seed, emerged successful against Paulina Vega, the no.20 seed, in three straight games (11-8, 11-6, 11-3, 11-3). Success for Chen Szu-Yu in her very first excursion; there was also success for Austria’s Liu Jia, a player very much at the opposite end of the scales. Making her 12th appearance in the tournament and thus equalling the record of Hong Kong’s Tie Yana, likewise she emerged successful in impressive style. Occupying the no.12 seeded position, she beat Egypt’s Dina Meshref, the no.18 seed, in four straight games (11-7, 11-7, 11-3, 11-5). Wins for Chen Szu-Yu and Liu Jia followed success for Hungary’s Georgina Pota, the no.10 seed. 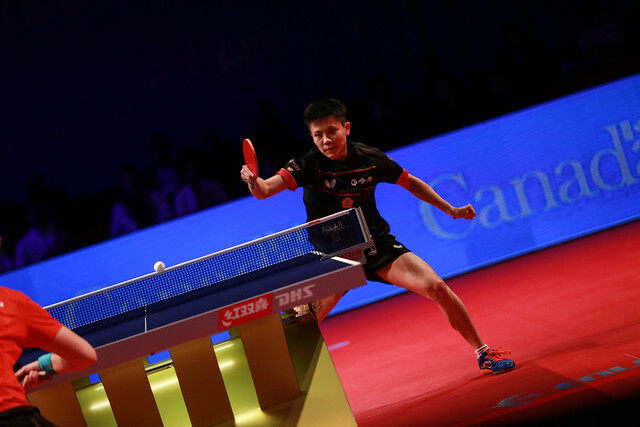 In the contest that signalled the start of proceedings, she overcame the pen-hold grip close to the table blocking style of play extolled by Australia’s Jian Fang Lay, the no.19 seed. The 32 year old Hungarian won in five games (11-8, 11-8, 10-12, 11-7, 15-12). Outcomes as predicted, it was the same in the contest which concluded the first series of matches. Korea’s Suh Hyowon, the no.9 seed, combined defence with sporadic attacking topspin strokes to beat Lily Zhang of the United States, the no.17 seed, in five games (11-6, 11-9, 8-11, 11-7, 11-7). However, there were some moments of concern for Suh Hyowon in the fourth game; after losing the third, she established a 6-2 lead only for that advantage to be reduced to one point at 7-6. Understandably, she elected for “Time Out”, the one minute break proved fruitful. At 10-7, she held three game points, the first was saved, not the second. Play continues in the first stage.